Play Renegade Clank! Events coming this Summer! 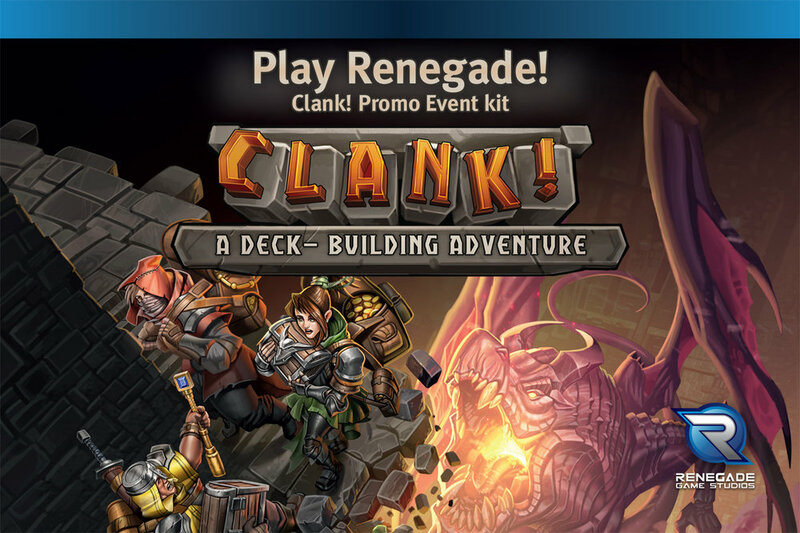 San Diego, CA (June 8th, 2017) - Renegade Game Studios is pleased to announce that this summer, Clank! fans will be invited to participate in official Clank! A Deck-Building Adventure events at friendly local game stores and conventions. Participants will play Clank! for a chance to win prizes, fame, and favor with the dragon! Friendly local game stores will be able to order kits from their favorite Renegade distributor. these kits will include promo cards, a special winner's promo card, and a Golden Dragon meeple. Stores are offered a variety of options for distributing these prizes to participants. Fans are encouraged to check with their favorite local game store for further information. At select upcoming summer conventions, each player in scheduled Clank! Tournaments will receive a promo card. The winner of each individual game will receive a special Champion version of the same promo. All scores will be collected and the adventurer with the highest score will receive a unique, handcrafted Dragon Trophy. "The excitement and love for Clank! has been overwhelming since last year's October release," remarks Scott Gaeta, President of Renegade Game Studios. "We have big plans for Clank! in the near future. These tournaments are a good way for fans to explore the current dungeons with a little more at stake while they await the next big adventure." Paul Dennon of Dire Wolf Digital designed Clank! last year. After the October release Clank! has collected multiple awards and nominatiraons including the Mensa Select Award, Dice Tower Seal of Excellence, Rahdo Runs Through Top 25 Games of 2016, and more. Dire Wolf Digital also released a free addition to the Renegade Game Studios Companion App that includes solo play and adventure modes for Clank!. In March, the first expansion, Sunken Treasures was released. More information about upcoming releases will be announced soon! Newer PostThe Fox in the Forest releases July 19th!